What’s your favorite version of Batman? Tim Burton’s? Christopher Nolan’s? Maybe you should consider that Batman: The Animated Series actually has the best Batman. Hear me out. Kaptain Kristian argues that Batman: The Animated Series set the template for what Batman was going to be for the next twenty years and influenced the source material more so than any version of Batman ever did. For example, Harley Quinn and Mr. Freeze became much bigger deals in the comics and in the movie adaptations after appearing in the cartoon. The movie versions of Batman don’t directly influence the comic books like that. 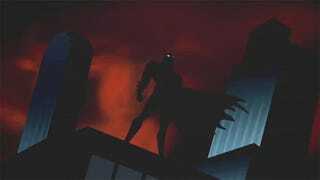 Plus, the animated series debuted during a time when the Batman movies were becoming more goofy and cartoony, while the cartoon was becoming darker and took on more adult themes. It set the future for what we’ve come to expect out of Batman. But perhaps the best thing about Batman: The Animated Series is that it gives us a better actual Batman than the other adaptations. In the movies, Batman almost takes a back seat to the villains because Batman’s villains are so good. In the animated series, we get a lengthier look at who Batman and Bruce Wayne were. And finally, the Batman voice in the animated series is so much better than the movies.